Weekly catch report of Badger’s Holt & Lac Serreire - week 3 - 10 May! "A fantastic week on both lakes with the complex record being beaten and several new PBs! On Lac Serreire, Shaun Fursland and Ian Pyke from the UK had 33 fish between the 2 of them. These included a PB and lake record mirror of 76lb 12oz (34.9kg), a PB common of 46lb (21kg) and a PB catfish of 84lb (38kg) to Shaun's rods. The majority of the other fish were 30's and 40's making this a session to remember! On Badger's Holt, Tomi Walch and Dietmar Norz from Austria had 10 fish with Tomi beating his PB twice in 24 hours with a 25.5kg (56lb 2oz) mirror and then later JoJo at 30kg (66lb). 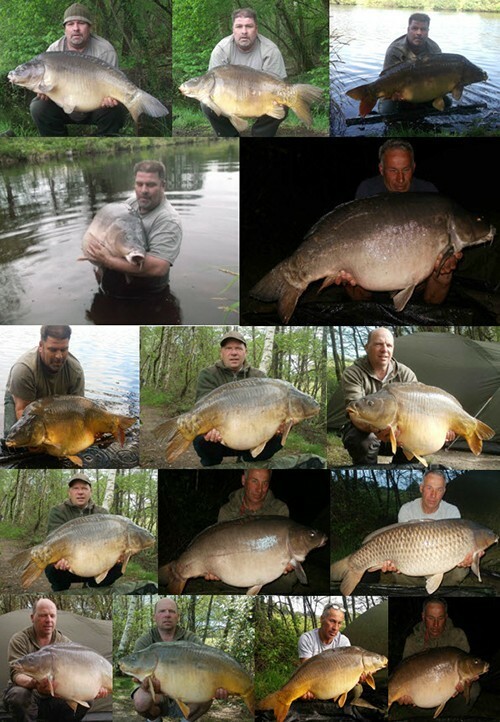 During the same day he also caught mirrors of 22kg (48lb 6oz) and 18.8kg (41lb 6oz). Dietrmar also had mirrors of 17.7Kg (38lb 15oz) and 21.4kg (47lb 1oz). The fish were tricky to catch and a lot of different rigs and tactics were tried before the first fish was caught on Tuesday after three days of hard work. The week then got better and better as time went on. Congratulations to all - What a week!"